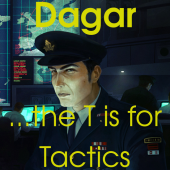 Dagar had the most liked content! I have contemplated vision systems a bit, and I'd actually like a system that emulates that a) you can move your eyes and head around more easily than you can rotate your body, so within a certain angle it should be really cheap to explore. b) Humans have vision focused on the centre of their vision cone, so things on the peripheral are not really perceived well. c) different lifeforms see well in different lighting conditions. d) movement is more easily perceived than a static target, and areas different in texture or colour are more focused on than very uniform areas. In a Xenonauts-like system, simulating this to a reasonable degree could look like this: a) when the unit is static or moving slowly, a large portion of its forward area is explored, while when panicked, suppressed or sprinting only a small, specific area is perceived. b) towards the edges of the vision area, it is less likely (percentage-wise) to spot a threat. This could be extreme in e.g. the case of an unexperienced sniper just staring through his scope, but that would lead to all kinds of wonky extra rules, which I am not a fan of. c) the brightness of the surroundings play a role in how far you can see and where you most likely spot enemies. At the same time, it makes it less likely to spot targets in darker areas, because the light also draws your vision focus and "overshines" darker areas. Also, that could make cool use of light mechanisms and items like flares, night vision goggles, flashlights, if different aliens had different light levels at which they perceive vision cues well. d) That could give rise to ambush and hiding mechanisms. In the extreme, e.g. a Sebillian grunt may not even perceive your troops if they stand perfectly still and do not attack, and Psyons panicking your troops to run around or twitch could be even more devastating. At the same time, Ghillie suits and other camouflage (also for Aliens) could become a useful and cool thing. Pretty easy, you should be able to find it online. If you can stand waiting a few weeks, I can send a scan to you once I unpacked my moving boxes. Keine Ahnung, was Sentinel genau ist, hab Vanilla nie so weit gespielt und in X-Division bin ich da noch nicht. Ich würde aber generell solche Eigennamen nicht übersetzen. Du übersetzt doch bestimmt auch Foxtrot nicht. What exactly does retiring for you mean? You are not going to make any more changes, I presume. But will you also stop communicating here? Good on you regardless, you earned it. Thanks for all the work you put in that wonderful project! I think that is a problem where the rift between how the game plays and its lore is not really feasible to bridge. Personally I am on the train of "we never encountered such opposition, so we all are essentially rookies here". It could be argued that in real life military, for the individual the familiarity with the situation and the according experience are worth more than the "natural abilities" or training for other circumstances, as well as tactical cohesion of a group of soldiers is more important. That does not really play well with the aliens pretty much behaving as human soldiers do individually (i.e. shooting, going for cover, throwing grenades...), but that can't really be helped. From history you could e.g. make the analogy to the soldiers in WW 1 hunkering in their ditches when encountering mustard gas. I bet many of them had fighting experience prior, but the new element made rookie and trained soldier react in the same way. Hey, schön, dass du das machst. Ich bin neugierig: Was hat die Übersetzung mit der Bildschirmauflösung zu tun? Wo verschwinden bei geringeren Auflösungen Textstücke? Yeah, that's not intended, and afaik fixed in one of the latest unofficial versions. @LagannPM Welcome to the community: 1. Yeah, that one is actually pretty bad Edit: see posts below for correct and detailed answers 2. Try it out I'd say. If the missile screen of a UFO is too much for aircraft without Antimissiles, you'll know when you need them. 3. Not completely sure (I am not that far yet), but I think Alien Fighters are slower but sturdier and thus better suited against medium sized targets, while Asierus are the pure Anti-Fighter plane. 4. Understand the stun system. A unit's stun threshold is as high as its max HP, so that many stun damage you will have to do. At the same time, each HP damage is halved and applied as stun damage as well. That means hard tu stun enemies should be damaged first. Note that some units regenerate HP, but nothing raises its stun threshold again. That means you can essentially stun Sebillians with conventional force if you wait for enough regenerates. 5. Nope, that's an artefact from the base game (that was not even present there I think). Sebillians are affected by smoke and fire as any unit is: smoke blocks sight, fire damages. Smoke stacking is a thing. 6. You can collapse any building if you do enough damage to it. 7. Not sure if better, but you can damage doors with gun fire also. But improved Alenium explosives do pretty good damage. 8. That I don't know. 9. Yeah, try not to destroy the stuff inside the UFO. 10. Yep. And they are two different aliens, so Scout Op does not necessarily unlock everything Light Scout Op would have. Nope, haven't, and I can't say that my intuition about the intuitiveness of that system is right, especially after @wulf 21 already stated that it plays good. Xeno 1 already solved that by stripping soldiers of all finite equipment, at least if they are too wounded to participate on a mission. But it's good that the system is intuitive to you! One idea that came to my mind to justify giving more crash sites to the factions instead of doing them yourselves from a lore standpoint: This is the Cold War era, where the significant powers were on a race for technological supremacy as much as military strength. That means they will want these alien artefacts, and that without your interference (who is to say that you don't keep crucial technology from them if you salvage all the crash sites first, and give it to their opponents?). They may even get angry at you, deterioriating relations and cutting funding, if you do not share artefacts and/or technological advances and/or resulting military equipment with them. What is more, with that kind of technological leap, any nation could have the potential to become a new, third super power next to the established ones... Maybe you would actually race against the nation's military and intelligence agencies to the crash sites, especially if they are not fond of you. Which could be an incentive to do night missions, something which you pretty much never had to do in Xeno 1. It definitely is useful if the soldiers are getting good at everything as they did in Xenonauts and if it warns you of overloading the replacement soldier due to lower strength. But I think it is bad because it is not intuitive. If you have played any game of that kind you expect the soldiers to have custom loadouts, mostly because it has always been that way and because similar games of the last years have much more focus on the individual characters than on the squad. If you want to go that route, I think a good idea would be to make that system as clear as it gets. That might involve showing the loadout on the dropship assignment screen or having according role symbols fixed to the slots, though that does not really play well with how at least Xeno 1 had roles more as a suggestion than an actual rigid system. In fact, maybe the best thing would be to unify the soldier loadout and dropship spot assignment screens with some overview of at least the most relevant inventory items of each unit, such as armour and main weapon. It always bugs me to have to go to the hangar to select the order of units in the dropship, and also it is quite tedious to scroll through all soldiers to determine which pieces of equipment I have on the team and which I forgot. If you were to press that dropship slot centered loadout system onto Xeno 1, I would dislike that very much, even though it would be practical.